Thanks to a few busy weeks/months, it's been a while since I managed to write an update of our life with PDA on this blog. I do tend to do more regular updates over on my blog Facebook page, so I'd love it if you could join me over there at www.facebook.com/stephstwogirls. Sasha started at her new special school just before Easter this year. The past few weeks have been increasingly difficult and culminated in a meeting about attendance last Friday. There's a few factors which were contributing to the struggles, not least the heat, which Sasha has found very difficult to deal with. We've always assumed she has a higher body temperature than most children to start with- this winter she didn't wear a winter coat at all! So the heat is pretty unbearable for her, and that, coupled with those days in the run up to the end of term where schools veer away from the standard routines and start to introduce things such as fetes, sports days and picnics, have all taken their toll. I wasn't at all sure that I'd manage to get Sasha to school this week, but thankfully last Friday afternoon her amazing teacher talked her through a schedule for the week ahead, and that seems to have helped massively. It could also have something to do with the fact that Sasha was given some control over what went on the schedule (within reason of course!). On Monday morning Sasha told me that this week wouldn't involve any work at all, and I groaned inwardly, because I knew that if that was a misunderstanding on Sasha's part, then I'd be in for a difficult time after school that day. All went well though thankfully and Sasha's class teacher sent me the above photo of Sasha staying cool in class via a great new communication app which the school are using, called Class Dojo. Technology has definitely made some great improvements to our lives! I know that Sasha is looking forward to watching the movie 'Inside Out' this week at school; this is one of only four or five films which Sasha has ever sat through so it was a lucky choice by school! Three years ago, we wrote our Inside Out review; it gripped her back then but I'm wondering if the emotions will mean even more to Sasha now. There have been some huge successes from Sasha's new school and I'm going to try to cover them in a separate post very soon. 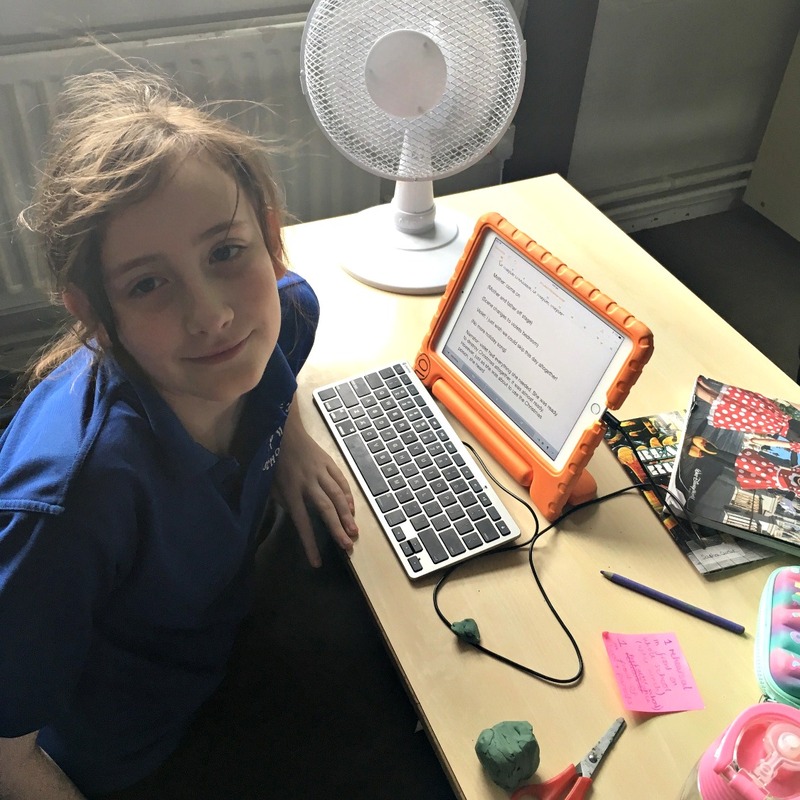 Although there have been some changes to routine for Sasha in these last few weeks of term, it's nothing compared to the amount which would have been going on for her if she had made it to the end of her mainstream junior school. Sasha is 11 now, and would be in year 6 officially, but she moved straight into a mixed key stage 3 (years 7-9) class at her new school. Which is great, as it means no big transition for her in September. Her old classmates have been through SATS (which Sasha has skipped, thankfully!) and are now going through lots of 'lasts' - assemblies, school shows, day trips, discos, masses and other random parties. I read a fab post from a great friend of mine whose writing I adore this morning, and it made me almost cry with laughter and relief that I wasn't going through that. Do read 'the end of term endurance event'. One of the old school mums dropped a Yearbook round for Sasha today. The Yearbook is something done annually at that school - a photobook full of pictures of all the children from Sasha's year group (two classes, so sixty children). Pictures taken over the past seven years of both infant and junior schools, and a mini portrait plus questionnaire for each child. I wasn't sure how Sasha would receive it (or if she'd be mad at me for sending in photos of her) so I casually left it on the sofa where she usually sits for when she came in after school rather than hand it directly to her. Unexpectedly, it brought tears to her eyes. She read every single page of it and declared that it was 'cute' and made her 'emotional'. I've asked her a few times before if she wanted to go back in this term to say goodbye, but she finds a lot of attention difficult to deal with so she rejected the idea, despite 'kind of' wanting to go in. This feels like a nice way to say goodbye to her old school, some kind of closure. I wasn't expecting the emotion from her, and of course it made me blub too, but it was lovely to see in a way. She spent so much time with those children and they really did look out for her. 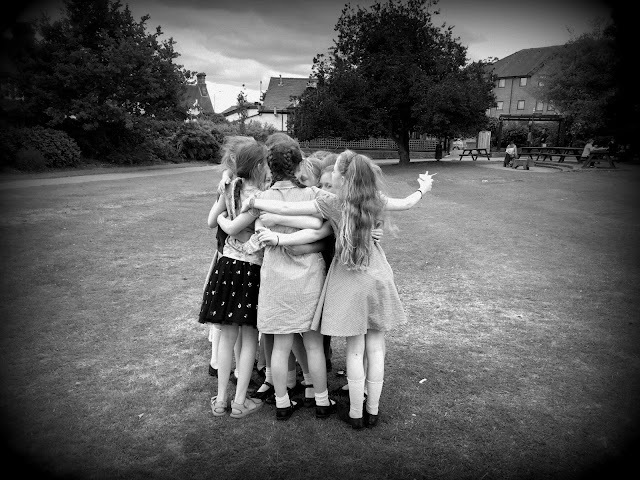 This photo below was her classmates giving her a group hug in the park last summer, a few weeks after Sasha had left school because she felt unable to cope there any more. Even without my nostalgic rose-coloured spectacles I can say it was a great school for Sasha; we held on there for as long as we could but Sasha's time to move on just came a bit sooner than it did for her classmates. At the weekend just gone Sasha was invited to the party of a girl from her new class. Despite the fact there were activities she loved and was looking forward to there (a bouncy castle in particular!) and a few friendly faces which she knew from school, Sasha was unable to engage in the party at all. We left at her request after just 15 minutes and she spent all that time by my side, or hiding behind me. She told me that she felt 'socially awkward', embarrassed when people looked at her, and that she felt others were judging her. Her anxiety levels were so high and it made me quite sad. My brother gets married in two weeks' time... let's just say I'm 'slightly' nervous about how that big day with lots of family is going to go for Sasha! Sasha realises now that she is struggling with any kind of friendships, largely because she needs to be in control of everything and everyone. Even though she can see this is a problem, she feels unable to change how she is. I suspect we are going to have to work hard (in a way that she won't realise) over the next year to try and equip her with some skills to manage relationships better. The past few days have reminded me that this life is like a roller coaster ride which we've never been on before. We don't know when the dips are coming, how deep they are, or when they'll go back up, Hopefully we will always be returned to starting level at least, and if we're lucky we'll reach some great highs along the way.